SchoolCity SUITE offers Text to Speech as one of many student accommodations when taking online assessments within the Student Portal. If the Text to Speech Online Tool is set by the Assessment Administrator/Assessment Creator, or as an individual accommodation through the Online Administration screen, students will have the option to have the assessment items, answers, and passages read aloud. Once the student has logged into the Student Portal of SchoolCity SUITE and started an assessment, students will be able to utilize Text to Speech options if permission has been granted. Text to Speech for Passages: If Text to Speech is enabled for passages, students can use the audio buttons located to the upper right of the passage to have the directions and passage read aloud to them. Text to Speech Audio Settings: Click the speaker button at the right end of the teal green tool buttons to open the Text to Speech Audio Settings window. Text to Speech will highlight each sentence as it reads the whole passage aloud. By highlighting part of the passage, only the highlighted section will be read aloud when the play button is clicked. The Text to Speech feature will highlight the individual words in a different color as it reads the text aloud. Text to Speech for Items: If Text to Speech is enabled for items, students can use the audio buttons located to the upper right of each assessment item to have directions, items, and answer choices read to them. Text to Speech will highlight individual sentences as it reads and each word as it reads aloud. Students can also highlight individual parts of the item and click the play button to have that part read aloud. When Text to Speech has been enabled for an assessment, you can hear items, answers, and passages read aloud by using the set of buttons in the upper right above them. 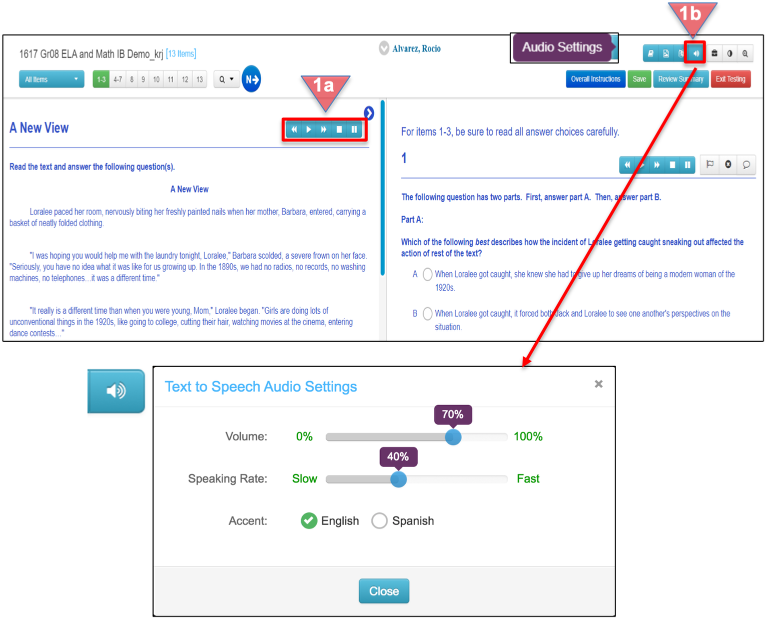 See “Text to Speech Settings” in Step 1, above, for how to control the speed of speaking and the pronunciation language. Text to Speech (TTS) Can Be Enabled for non-ELA Assessments: Enabling Text to Speech is no longer restricted to assessments with the Subject set to “ELA.” The TTS system can also read mathematical expressions in items when those expressions have been authored with the equation editor. Expressions that are created using only text formatting or that are displayed as images will still not be read aloud correctly.